Isolated areas, groups of non-descript teenagers and evil forces greater than mankind are essential ingredients to create a Horror film, right? Following on directly from Evil Dead II, Ash finds himself back in time and captured by medieval soldiers. After proving his worth, Ash joins forces with the soldier’s leader, Lord Arthur, to retrieve the Necronomicon Ex-Mortis, the book of the dead, which will also lead him back to the modern day. Army of Darkness sees the franchise move away from Horror and focus more on the action genre, something that Ash’s characteristics are only going to compliment. With sequences like the early chainsaw equipped pit battle with the Deadite, Raimi tries to balance the action and horror scenes, to not draw too far from its roots. Despite the plot being based around a horror theme, i.e. the book of the dead and zombies, the fights and battles take priority. 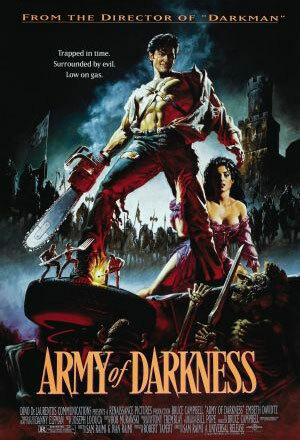 The change in the genre means that Army of Darkness is not scary anymore; however it does retain its extreme gore. The success of films like Die Hard and Terminator 2 could have influenced the horror genre at this time, and could be one reason for the new action elements. Despite the serious action sequences, Army of Darkness maintains the comedic, tongue-in-cheek element of the franchise. This is displayed when Ash’s reflection turns into a hundred miniature Ash’s who start to attack him, not unlike the well known scene from Gulliver’s Travel. From this, Evil Ash is born, providing our hero with a solid and obvious enemy, rather than a series of life-less zombies. This is a welcome addition to the franchise, creating more of a narrative, something which is also present in Ash’s love interest, Sheila. Army of Darkness is a strange next step for the Evil Dead franchise however as an individual film, Raimi creates a flowing and enjoyable sequel. If you enjoyed the first two of this franchise, you are likely to enjoy Army of Darkness; if not for the plot or action sequences, then definitely for Ash’s character and fighting skeletons.